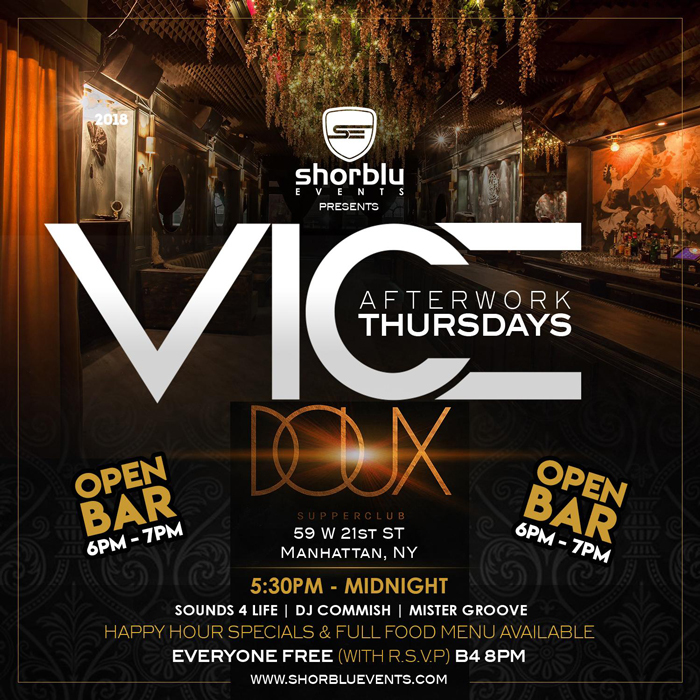 Vice After Work Thursdays. Each and Every Thursday... Thursday is the new Friday, after work why go home? Have a couple drinks with friends | family | your mate, or make new ones. Unwind after a long hard days’ work with killer early bird drink specials and delectable appetizers. Shake a leg or get down like there is no tomorrow to the Caribbean Rhythms and Vibes of some of the hottest dj’s including Back2Basics, Sounds 4 Life, Mr. Groove & DJ Commish playing the very best in Soca, Reggae, Hip Hop, RnB & The Hits. Rub shoulders with the likes of Machel Montano, Lyrikal, Shal Marshall, Dule Hill (Psych), Dj Young Chow, Aj Calloway (Extra/BET), Anya Ayoung Chee (Project Runway 2012 winner), Malik Yoba (Alphas/Why Did I Get Married), Kevon Carter (Imij & Co) & so many more, who have been known to stop by whenever they are in town. This Thur There Is No Better Place To Be! “Business Casual” Attire – This means no athletic gear of any kind: baseball hats, baggy clothes, jerseys, sweats, boots etc. Dress shorts accompanied by shoes and a button down are acceptable when it’s hot out.